First Lady of the United States Melania Trump joined a panel discussion on the opioid crisis for Convocation at Liberty University Wednesday, Nov. 28. U.S. Secretary of Homeland Security Kirstjen Nielsen, U.S. Secretary of Health and Human Services Alex Azar II, Liberty President Jerry Falwell and his wife, Becki, also joined the panel. Former Fox News commentator Eric Bolling, who lost his son to an accidental fentanyl overdose in 2017, hosted Convocation. QUESTIONABLE — Questions from the audience were taken during Convocation. “Opioid addiction is an illness that has truly taken hold of our country,” Trump said in her opening remarks. Trump explained her focus has mainly been on neonatal abstinence syndrome, which is a condition that occurs in babies who have been exposed to opioids while in their mother’s womb. However, Trump said she also wanted to encourage Liberty students as they entered a “critical stage” in their lives. “The independence that comes with being a young adult can be exciting, but also overwhelming,” Trump said. The First Lady has traveled the country to gather research on opioid addiction. Trump emphasized the importance of being educated enough to recognize the signs of addiction in an individual. Trump believes more people in the younger generation are affected by the opioid crisis because it is easier to get the drugs now than it used to be. Trump believes it is also because sometimes too many drugs are prescribed at once. According to Azar, the majority of people who become addicted to opioids did so after being prescribed a legal painkiller. However, not everyone who has been prescribed painkillers will develop an addiction. It is unknown exactly what causes addiction in some individuals and not others, but it is believed to be linked to genetics. Azar explained how many overdoses often happen. It usually begins when someone is taking a legal, prescription opioid. When that drug gets cut off, they switch to a street drug, and this is where it becomes extremely dangerous, because these street drugs are often laced with fentanyl. This is where overdoses can happen. However, for many, the danger is not over, even after treatment. Azar emphasized the importance of overdose-reducing drugs — drugs that can reverse an overdose. Because many addictions start from legal opioid prescriptions, President Donald Trump has worked to limit the opioids available. However, for some, the opioid crisis is a two-sided coin. During Convocation, Twitter exploded with tweets from users who suffer from chronic pain due to medical conditions and are now unable to receive opiate drugs because of the new regulations. “Hope if you’re not aware of the other side of the ‘opioid crisis’ you take a peek at some of the tweets by chronic pain patients today,” Twitter user Arianne Grand wrote. Other Twitter users criticized the fact that none of the speakers addressed chronic pain patients. CRISIS — Melania Trump believes the opioid crisis affects more people in the younger generation than the older generation, because it is now easier to acquire them. However, Azar agreed with Trump that it is important to remove the stigma associated with addiction. Some of these ways include therapy and medication-assisted treatments. Nielsen explained some of the methods being used to prevent opioids from getting in the hands of addicts. They are working to prevent illicit opioids from ever getting into the country by having agreements with international allies, working with U.S. Customs and Border Protection, and working with the Coast Guard at sea. However, Nielsen said much fentanyl still comes from China through the mail. She explained they have canine units at mail centers to detect these opioids. China agreed Dec. 1 to classify fentanyl as a controlled substance and will begin to restructure regulations. 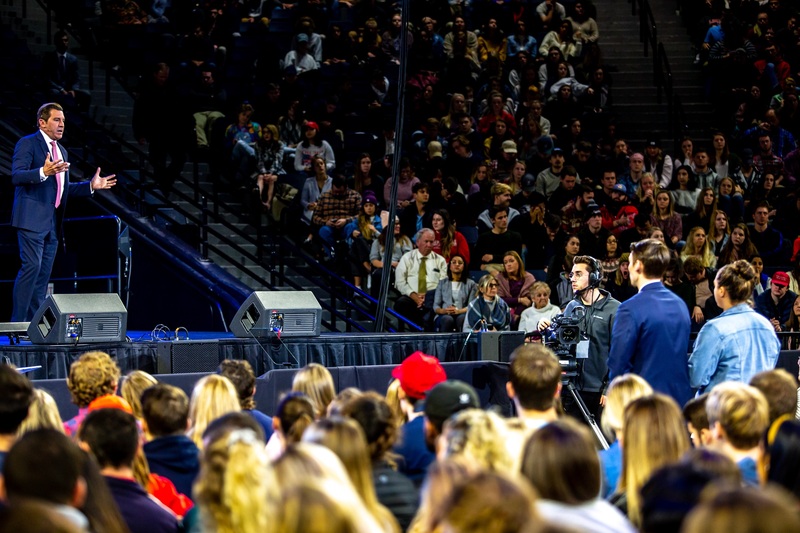 Near the end of Convocation, Falwell explained that Liberty had Naxolone, an opioid overdose reversal drug, available for those who had overdosed. Students in need of this drug can contact either their RAs or LUPD at (434) 592-3911. Singer Demi Lovato’s mother, Diana Hart, was also supposed to join the event, but was unable to attend due to a last-minute conflict. Those struggling with addiction can call the National Helpline at 1-800-662-HELP (4357). 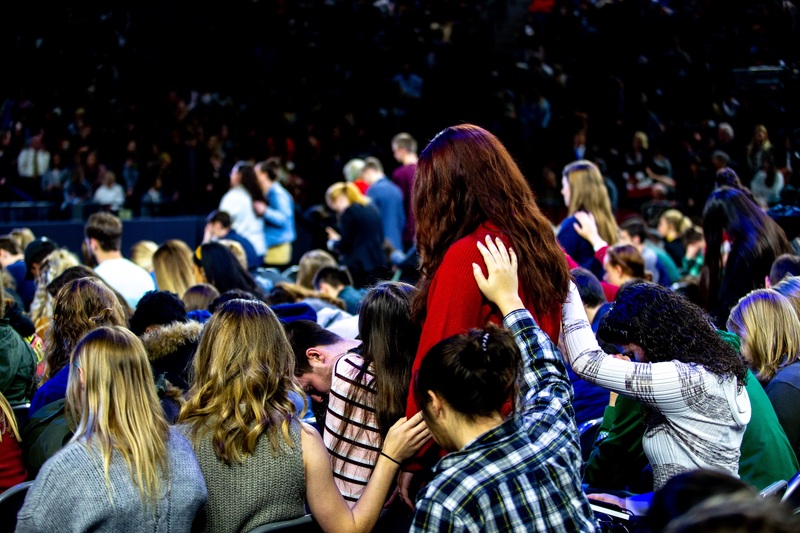 PRAYER — At the end of Convocation, students prayed for those who were struggling with addiction.